I am currently working on my own startup, Pay What You Like, which is a simple price tracking tool for any product. My desk is in my flat in London. It is a really small room, 1.25m by 2.25m so I need to make all the desk, shelves, keyboard draw and bookcases fitted to maximise the space. The beech wood desk is 1.20m height so I can comfortably stand if I wish. But this also gives more storage underneath. I also have a beech wood barstool to sit on when my legs get tired. I like the unfussy, study aesthetic. I spend so much time at my desk that I want it to be comfortable, welcoming and practical. I like being surrounded by my vinyl collection, and books. I have some art behind my monitors for some visual inspiration and to give my eyes something to re-focus against. Is there anything you would like to improve on this setup? I would tidy the cables better. I plan to cut a couple more holes in the desk surface so that I thread the cabling more efficiently. I also want, rather ostentatiously, to make charging dock for my Airwheel. Do you switch workspaces during your day? I spend all day at my desk from 8 till late. I have made the beech desk wrap round the wall. One side is for all my sketching and general paperwork, and the other is for my computer work. The ability to swivel on my chair and have another separate work area is very helpful. Can you tell us something about the items on/around your desk? My Mac rest on a D-Line Cable Tidy Unit which helps keep most of the cables in one place. 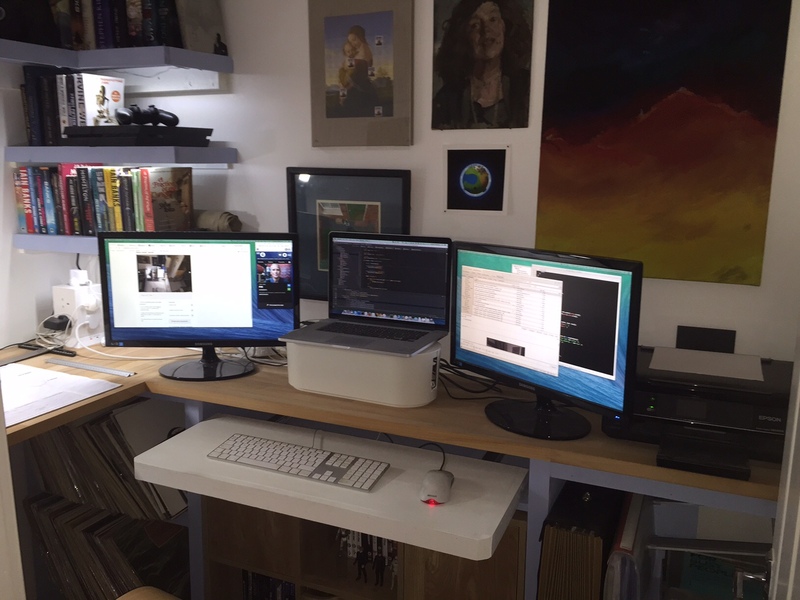 It provides a nice platform which keeps my mac and monitors at the same height. I have a large A2 sized desk pad that sits on my desk sketching desk. It acts as a desk cover, note pad, wireframing aid, coaster and diary. Once the top sheet of the pad is filled, you can just tear it off for a fresh blank sheet. Is there something on your desk which helps you stay focused? I find music helps keeps me focused. I have speakers for streaming music through, or if I feel analogue, I play some vinyl on my record player. I also write lot’s of ToDo’s on my desk pad. The less I have juggling around in my head, the better I perform. Desk Hunt reader submission by media director Annie Kotowicz. Desk Hunt reader submission by creative director Robert Stofer.